I’m still playing with the crepe party streamers…I had no idea how easy this stuff ruffles! 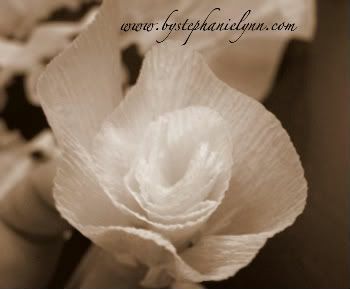 The flowers turned out so pretty yesterday that I thought they would make great corsages for Mother’s Day. 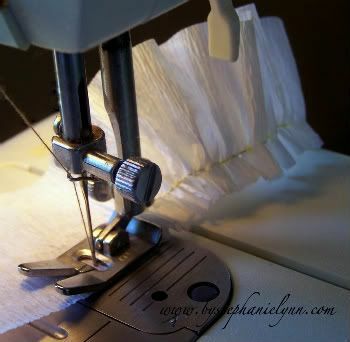 If you missed the sewing tutorial you can find it here. 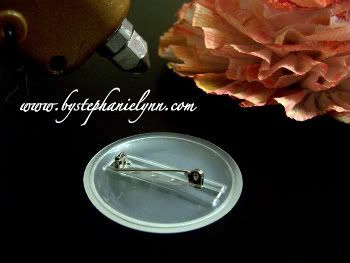 Below I will show you how I made the flowers and how to make them into a beautiful corsage for your Mom to wear on Mother’s Day! 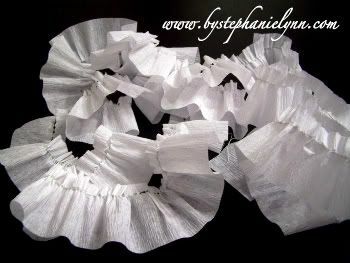 You want to begin by making basic ruffles with the Crepe Party Streamers. 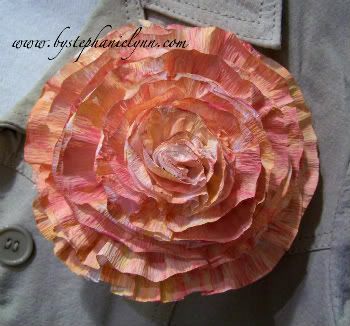 Again, if you missed the sewing tutorial you can find the details here. I made one continuous ruffle out of a strip of streamer cut to 120 inches long. 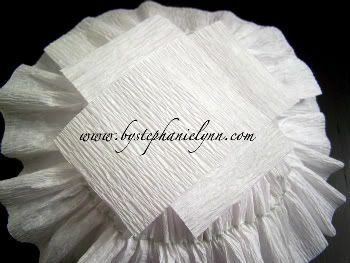 Begin wrapping your ruffle around the fold holding the bottom tightly. 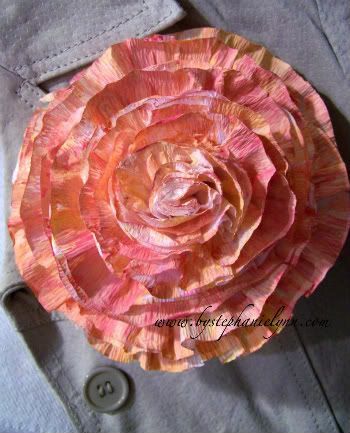 Go around about six times to create the center of your flower, then dab some hot glue on the end and fold a scrap piece of streamer over the glue to seal. 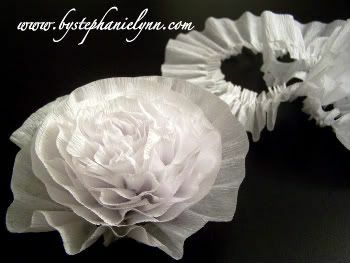 Continue wrapping the remainder of your ruffle around the flower center and hot glue the end to hold in place. 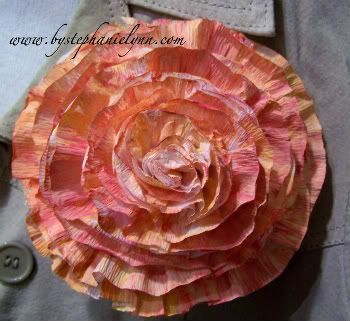 Turn you flower over, squirt a dab of hot glue on the back and place another scrap piece of streamer on top to hold. 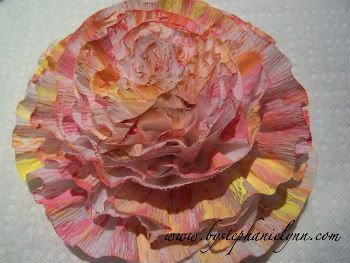 Once done flip your flower over, squirt some hot glue on the back and place two strips of scrap streamers over the glue as shown above. 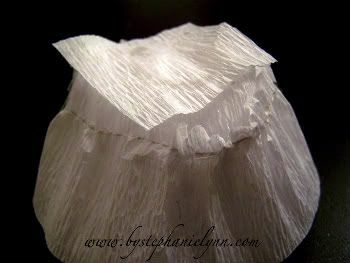 This will give you a nice flat back to work with and help hold the ruffles in place. I wanted to add some color to mine using few different shades of acrylic paint. I lightly brushed on the various colors making sure to get in-between each petal. While the paint was still wet I took a squirt bottle filled with plain tap water and lightly misted the entire flower. I then went back with my brush and blended in the colors. Once completely dry you have yourself a beautiful flower. I made a solid yellow one to go on the Ruffle Wall Canvas for my powder room. 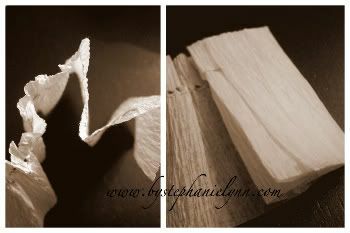 I just love the texture of the crepe streamers. or to wear any other day of the year! Enjoy! The Second Sunday Showcase Party will begin tonight! I have another great giveaway planned – Hope to see you there! 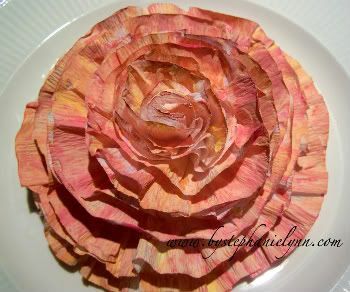 I recently found your blog and just love it…You are so creative….Who thought you could do this with crepe? They are beautiful! My mom once made me a Raggedy Ann Costume to die for. She made my wig out of red crepe paper. Your projects are great and bring back a good memory for me. 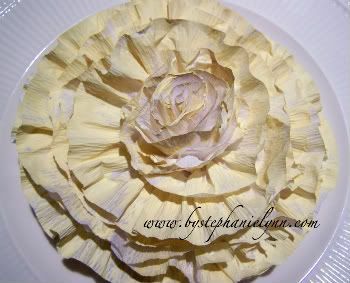 I just added this to the post I made yesterday about the crepe ruffles! Darling! Beautiful! I’m planning our Mother’s Day this weekend for the grandmothers. This would be perfect! I wouldn’t wear it, but I would LOVE it on a wreath or canvas. Stunning and so creative! 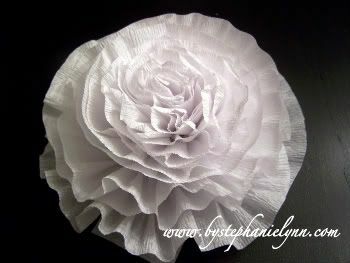 Those would be gorgeous on a wreath or in a rustic basket or urn. Love ’em. That is so neat! Thanks for the tutorial! Love what you’re doing with the streamers and your tutorials are fab. How pretty! Dropping by from BNOTP. Stunning! 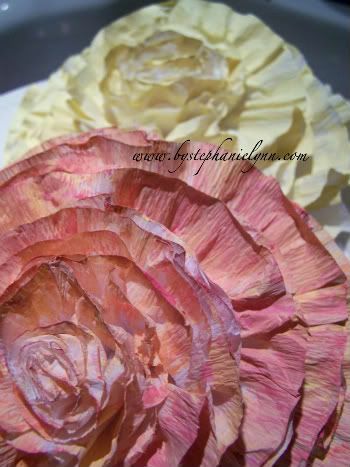 Who knew crepe paper could be SOO beautiful. Beautiful! 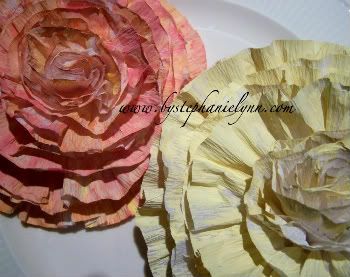 You would never guess those used to be crepe paper streamers! They look lovely! I am sure you mother will appreciate them. Those are super pretty!!! 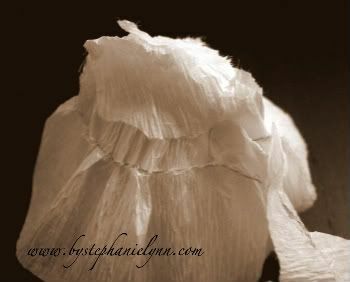 I made some tissue paper peonies for a baby shower recently but I think I like yours better. I’m just not very adept at using my sewing machine. Guess it’s time to practice! Wow! I am making some TODAY!! so fun and so easy! Love them! Love those flowers. They came out perfect!!!! Going to have to try that one. Thanks!!!! My great-aunt wore a May Day DRESS made out of crepe paper! stopping by from tater tots n jello! wow these are lovely!! thanks for sharing! What a lovely idea! I will have to make some for fun one day. I’ll be sure to post about it and send a link to your blog. Thanks for the idea. Super neat idea! I could see using those flowers for a lot of future projects! Awesome! I just had to make one tonight! I added it to one of my new fav crafts for gifting…a picture frame where I sew the picture on to either scrapbook paper or fabric. This was the perfect embellishment! YEAH! LOVE these flowers! Thanks so much for the tutorial. Just discovered your blog and I love it! Wow, this is gorgeous! I love the paint job, just beautiful! Thanks so much for sharing, I’ll be linking. 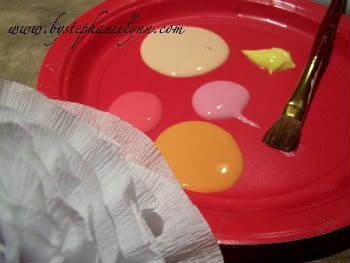 I’ve been saving this great idea, and I’m finally gonna link to your post – this weekend at Dollar Store Crafts. Thanks for showing step by step process. I’ll start trying to make something as beautiful as the one you created. Also color combination is very nice! Just beautiful and your tutorial is great 🙂 Thanks for sharing!